What Color Should a Hermit Crab Be After Molting? Although the concept of molting might be unfamiliar and confusing to many people and seem utterly bizarre, molting in hermit crabs is a totally natural and normal bodily growth procedure. When the wee crustaceans undergo molting, they essentially kiss their current exoskeletons goodbye to make way for new ones. 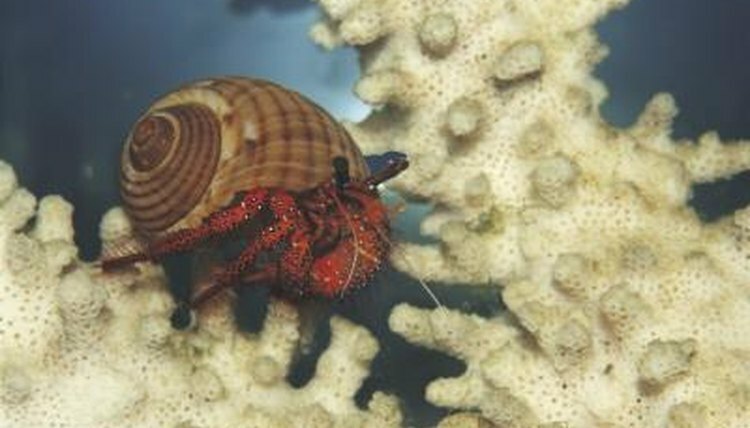 Molting is vital for proper hermit crab growth, and it occurs periodically for the small creatures. The process doesn't happen overnight, and it can take anywhere from a few weeks to three months or so, with bigger crabs typically taking a significantly longer time. When a hermit crab removes his exoskeleton, he consumes it. The consumption offers the nourishment needed for the replacement exoskeleton to solidify properly. After this whole process is completed, it's back to business as usual for the crab. After your hermit crab starts molting, you might notice some marked color changes in him. His overall coloring might seem a lot less vivid than before, and it could look sort of gray and ashy, particularly on the ends of the legs and around the joints. You also might notice some light beige elements on parts of your hermit crab's physique, particularly around the chelipeds. The ends of your hermit crabs might appear much more defined and precise than before molting began. Despite the physical changes, you can breathe easy, because nothing will be different about your precious pet's basic temperament and nature. It can be very helpful to prepare for your hermit crab's molting -- and future grayish color -- as much as you can. The experience often can be quite nerve-racking for the little guys. If your hermit crab is on the verge of molting, you might notice significantly decreased activity, glazed-over eyes, inordinate amounts of digging, changes in appetite, weakness of the legs, the emergence of a gel limb, and eye crust. If you see any or all of these signs, you probably know just what's about to happen.